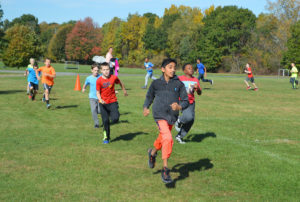 The annual Genet Fall Fun Run is scheduled for Wednesday, October 17 at the track behind school. Parents are invited to come and cheer on the participants. The goals of this voluntary event are to encourage running as a means of both fun and fitness, to expose children to healthy and challenging competition in a supportive environment, and to experience the joy of participating in a challenging activity. 2nd Grade – 12:50 p.m.
3rd Grade – 1:10 p.m.
4th Grade – 1:50 p.m.
1st Grade – 2:10 p.m.
5th Grade – 2:30 p.m. Awards will be presented after each race and all runners will receive a certificate of participation for their effort. All students should wear appropriate shoes and clothing for running and the weather.